This shows you the various aspects of the client preview using a sample proposal. It shows you what clients can interact with. Send. 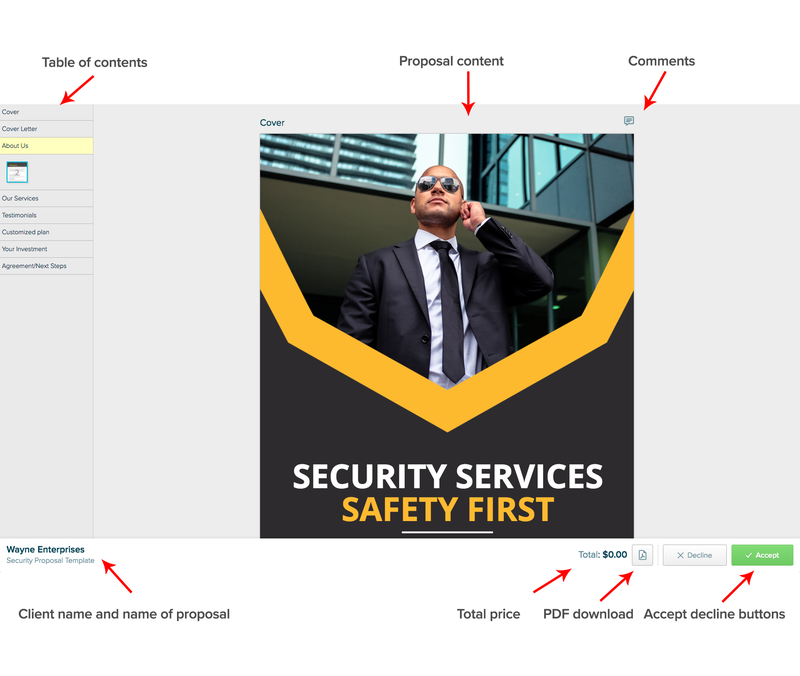 You send out your proposal through Proposify, so your client gets an email with a button to view the proposal. You can customize the design and content of the email or paste the link into your own email tool and send it from there. View. When they click the button it opens their web browser and loads the proposal. You can use your own domain (URL) so they don't see proposify.com in the URL. Interact. In the preview your client can click on a section in the table of contents, leave comments on specific sections, select optional fees, select how much of something they want to buy, watch a video, and download a PDF. Customize. You can customize what clients are able to do in the preview. You can turn off the total price, the accept/decline buttons, the PDF download, and commenting ability, either account wide or on a proposal-by-proposal basis. You can even lock down proposals with a password. If you've added a signature to your proposal the client will need to sign in order to accept the proposal. Clients can open your proposal on their phone or tablet.